The ideal Server/Networking storage solutions for IT Centers, classrooms, small businesses, music studio and even your home. You can even use it for your entertainment system, Blu-Ray/DVD/PS4/X-BOX/STEREO SPEAKERS. Sturdy and heavy duty wall mount brackets to support it's max weight. Simplifies installation and equipment maintenance while taking up little space. Open frame cabinet / wall rack provides maximum airflow along with ease of access to all equipment on the rack from all sides. This will allow you to easily adjust cabling, view LEDs and access configuration buttons as needed. 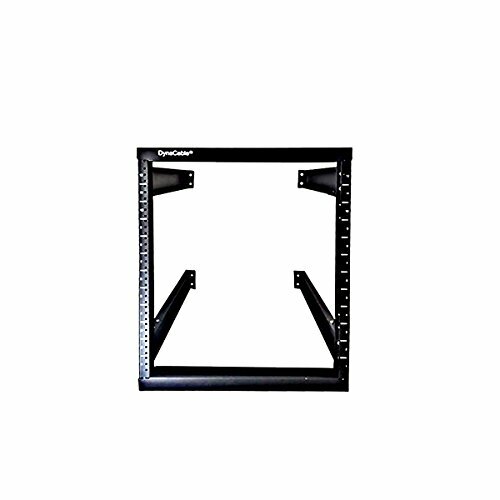 Universal 19" rack equipment. Perfect for mounting patch panels, rack mounted power strips, shelves, and all other server rack equipment. Great for all businesses requiring to save space on equipment with minimal wall space, accessible and easy to maintain. Cold Rolled steel makes it safe in any environment and prevents corrosion. If you have any questions about this product by DynaCable, contact us by completing and submitting the form below. If you are looking for a specif part number, please include it with your message.